Neg. Size: 6½" x 8½"
(Bride) Mrs William J.R. Connell, née Eileen Isobel Raymond Came ( ); elder daughter of R. Raymond Came, of 8, Weymouth Street, Portland Place, London W1; m. (1928) William J.R. Connell. (Bridegroom) William J.R. Connell ( ); son of Allan Connell. 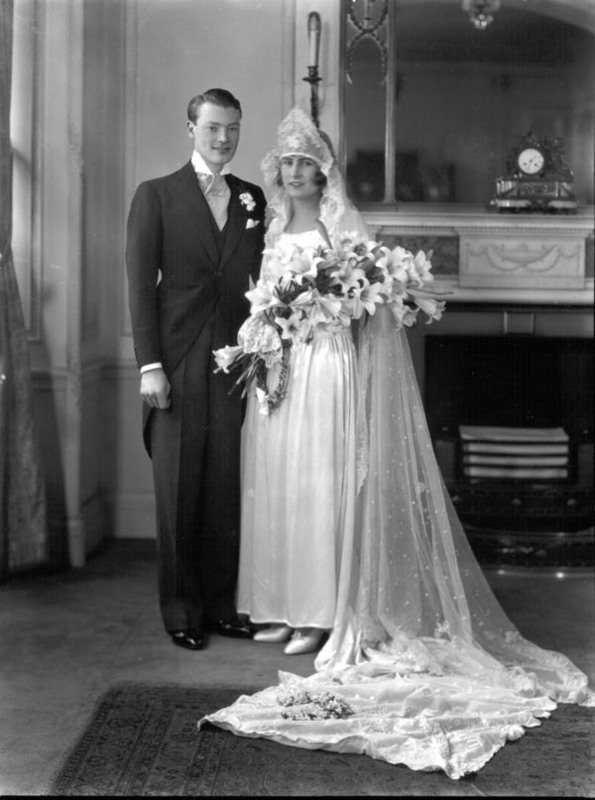 Occasion: The marriage, 3 October 1928, at the Church of St. Martin-in-the Field. "...mediaeval gown of ivory ring velvet, the only trimming being a pearl ornament at the waist. Her beautiful antique lace train was mounted on lettuce-green chiffon, and over it fell her veil of similar dentelle, arranged to form a pointed coronet. She carried a sheaf of Harrisii lilies" (The Morning Post, 4 October 1928, p 9d). No of related negatives: 3. Biog: The Morning Post, 4 October 1928, p 9d [account on the wedding]. Occasion: The Morning Post, 4 October 1928, pp 7 (photograph) & 9d (text); Eve, 17 October 1928, p 154. Costumes: The Morning Post, 4 October 1928, p 9d. Reproduced: (version) Eve, 17 October 1928, p 154.